It was a rough homeschooling start for Social Studies. We tried the Regions curriculum Amber's parochial school used. It was awful, simply put. We tried a very nice U.S. regions curriculum written by a homeschool mom. It did the job of supplementing the original Regions and gap filling until the next ordered curriculum arrived. It really was geared to kids a little younger than Amber. Reading past her assigned section! Finally, this week we started with Alpha Omega's LIFEPAC American History for 5th grade. What a difference! I, honestly, wasn't sure this would be it either. It looks like a lot of reading and question answering and not a lot of excitement. The teacher's guide does have quite a few suggestions for projects, which we are utilizing. The surprising part is Amber's reaction. She absolutely loves it! She can't wait to read further about the colonization of North American and the beginnings of our country. This is the very topics she never wanted to revisit. Amber keeps telling me, "Nobody ever mentioned these facts before". She finds the entire history being retold to be fascinating. I'm thrilled that we have found something to interest her. She won't finish the entire LIFEPAC this year, but will use it next year in conjunction with another curriculum for 5th grade. This has been one of my best purchases to finish up 4th grade. We also started watching a PBS tv series I saw when Amber was tiny and filed in the back of my mind for when she was older. It is called Liberty's Kids. I only saw a few episodes on PBS that one 4th of July and never found it on TV again. Last week, I found it by accident on Amazon. I was looking for a couple of fun DVDs on the revolution and the entire Liberty's Kids series popped up. It was very reasonably priced and I'm very good at purchasing from Amazon. It arrived Monday and we've been watching a couple of episodes a day all this week. It is another winner! Amber can't get enough of it and wants to keep watching it, even at dinner. Tonight she even gave up PS3 time to watch another episode of Liberty's Kids. The series is all factual, based on events that led to the American Revolution and events during the revolution. It has real characters like Ben Franklin, Paul Revere, John Adams, etc. 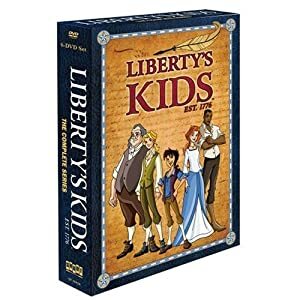 The "kids" in Liberty's Kids are fictional, but like I explained to Amber, they are children that very well could have lived at the time but we don't have documented proof of their existence. One of the episodes tonight showed a man being taken by "patriots" to be tarred and feathered. One kid thought it was funny until he saw the man at the doctor afterwards. He had no clue, since the man was able to walk way from the punishment, what had actually happened. The doctor explained what results are to a person after being tarred and feathered. This was just a side event in the episode, but showed the real things that did happen and how it may sound funny while being life threatening. It also demonstrated how some people used the name of "patriot" to do unkind and illegal things. I'm quite pleased with the LIFEPAC and Liberty's Kids series. Amber is once again excited for Social Studies time and is even willing to do more than assigned because she is so interested in the time period. Thank God this is working.